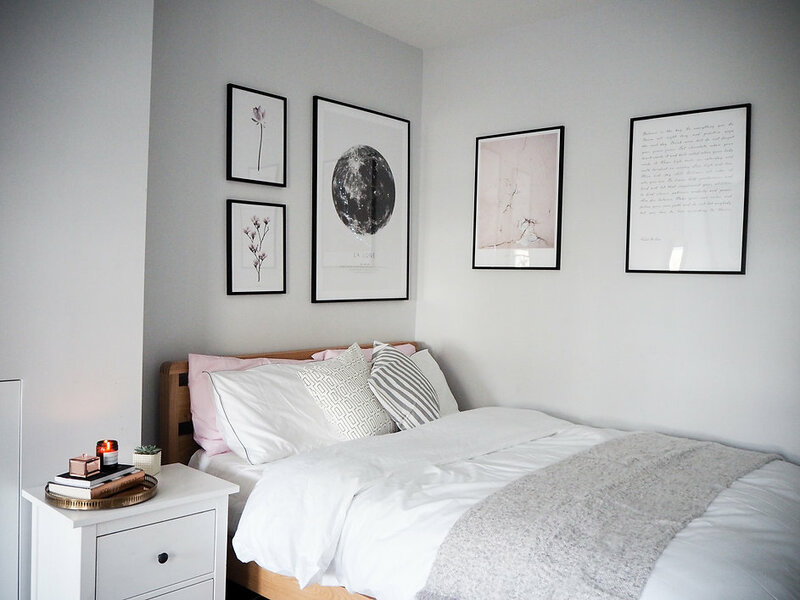 If you caught my post on revamping my bedroom last weekend you’ll have noticed a pretty slick gallery wall (if I do say so myself!) going on. 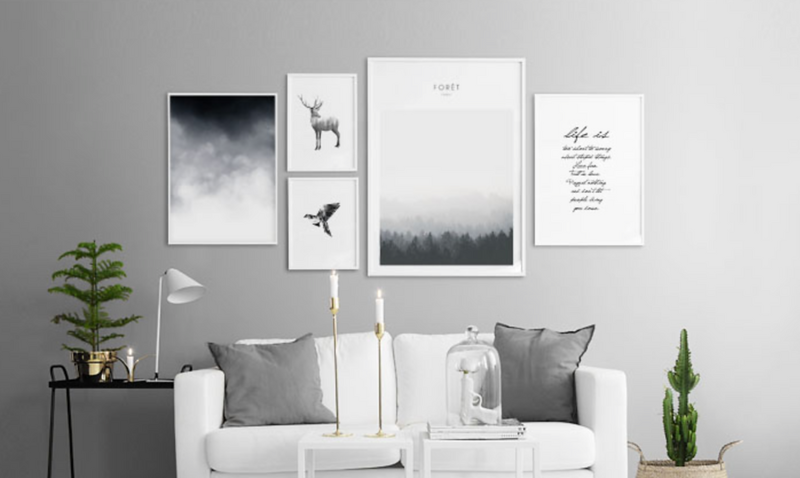 Art is the perfect way to jazz up any room but the days of half-heartedly sticking a frame on each wall are well are truly over; now it’s all about creating a mini gallery in the comfort of your own home. I’m pretty proud of myself because I used an actual hammer and nails, didn’t break a nail or cause some major crack in the house foundations and the pictures are straight! Okay, angry caps because this is the stage that I entirely missed out. As a result when my art arrived I realised that it wouldn’t actually fit in the formation I had planned and on the wall that I had intended it to. Oops. So grab a tape measure and a friend with long arms and work out the maximum width and height that your overall gallery can possibly be. Make a clear note of these measurements! I’d recommend using a sheet of A4 people and drawing a quick scale so that you can visually see the width and height you have to work with, and whether your gallery is going to be square or rectangle. This is mega important. As important as section one! Once you’ve decided on your formation you need to work out what size each piece needs to be and the only way to do this accurately is by using your measurements from step one and the helpful ‘sizes’ section under ‘Prints’ on Desenio. Because I hadn’t bothered with step 1 I ended up over zealously ordering art far too big to attach to my wall in the formation I had planned. This is the really fun bit. Desenio have literally hundreds to choose from and you can search by style or colour, so it helps to have some sort of idea of what theme you’re going to go for beforehand. I had decided that my wall was going to be a combination of black and white and soft blush pinks to compliment my bedroom pallet. 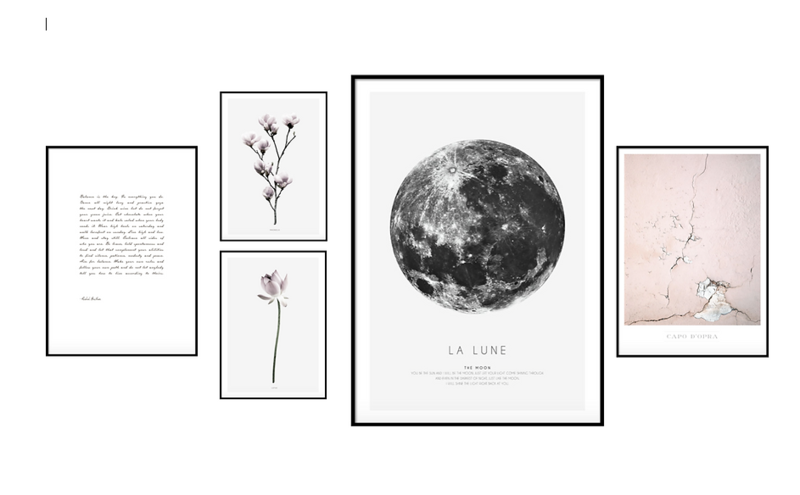 Once I had narrowed it down to 5 prints I began experimenting with the layout. I screenshot each print and then pasted it into a word doc then moved them around the page as per my formation so that I could see which were best placed where. Once you’ve had a play and decided on this, go ahead and add each print to your basket in the corresponding size. Uhm…this is where idiot moment number 2 happened. I don’t even know how I did it, but I managed to order one print in a size up than I actually wanted it. Thankfully it was the quote which has lots of white space around it, but I really had not intended to fiddle around with a ruler and scissors before framing. So don’t do this. I went for simple black ones, but there are white ones and a rather pretty copper shade too, so decide what will look best in your room and then add the corresponding frames to your basket! When they arrive popping them in their frames *should* be a quick and easy task (unless you’re me) and then it’s just a small matter of a hammer and nails. 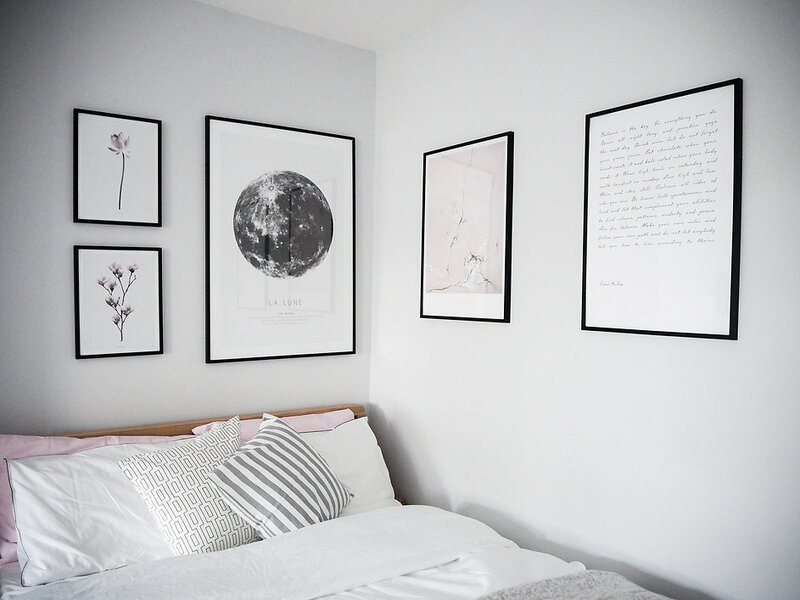 Lay the prints all out on your floor or bed in the formation you want them on the wall. If you want to be really, really accurate then use some masking tape to map out on your wall exactly where each is going to go, and where the nail needs to be. As you’ve probably guessed, I’m not that sensible so instead I just kind of went for it! I used a pen to mark where the first and largest picture was going to go and then once that was up I measured the distance to the next one, and the distance between the top of the frame and the hook to ensure I placed the following prints in the right places. It was actually really easy and afterwards I felt like a total DIY goddess. TA-DAH! Okay, so it’s not how I had originally planned but I am actually very, very happy with how my gallery wall(s) turned out. I was lucky in that I had the space to adapt my design, but do follow the steps above clearly so that you don’t have a mini heart attack when you open the box! Prints and frames received courtesy of Desenio. All views my own.